AP Schools Rationalization Schedule, Guidelines-AP Rc.4102/AP GO.29 AP Schools, Posts, Staff(Teachers) Rationalization Norms/ Guidelines 2017. AP School Posts, Staff, Teachers rationalization guidelines, AP Schools staff rationalization Schedule, AP Primary, UP, High schools rationalization guidelines and Schedule, AP Schools rationalization Schedule and guidelines, AP Schools, Posts, Staff(Teachers) Rationalization Norms/Guidelines: Norms for Rationalisation of Schools, Posts and Staff under various managements (viz.) Government, Zilla Parishad, Mandal Parishad Schools in AP. Sub:- School Education - Norms for Rationalization of Schools, Posts and Staff under various managements (viz.,) Government, Zilla Parishad, Mandal Parishad Schools - Communication of Government Orders - Instructions I Guidelines - Issued - Reg. Read:-G.O.Ms.No.29 School Education (Ser.II) Department, Dated:22.05.2017. A copy of the Government Orders cited above is herewith communicated to all the Regional Joint Directors of School Education and the District Educational Officers. Necessary action may be taken for implementation and completion of Rationalization exercise as per the time frame communicated hereunder. In this connection, the norms and guidelines appended to the G.O. should be followed without any deviation. Further, the following guidelines are issued to facilitate the exercise smoothly. 1) The school rationalization will be taken up based on the integrated U-DISE Data as on 31.12.2016. 2) The required integrated U-DlSE Data will be provided to all the RJDSEs and DEOs from this office. 4) The Final list shall be submitted duly countersigned by the Chairman of the District Rationalisation Committee on 1.06.2017 for taking necessary action thereon. 5) It should be kept in mind that the main objective of the rationalization/consolidation exercise is to provide teachers in schools where there is high enrolment and deficit teachers so as to improve quality of education. Hence, proper care and attention should be paid while arriving at the scope for consolidation of schools, keeping in view the exceptions indicated in the related GOs. No scope should be given for any complaints or injustice in the matter. 6) The U. P. Schools having VI and VII Classes with enrolment of 60 and above can straight away be upgraded into a full-fledged High School from 2017-18 onwards by opening VIII class, subject to availability of required infrastructure facilities in the school and provided that there is no U.P I High School nearby the school within 3 KM radius. 7) With regard Point Ill under Table-Ill-A of G.0.Ms.No.29 School Education (SER.II) Department, Dated 22.5.2017, relating to High Schools with enrolment slab crossing over and above 1200-1240 student enrolment, one additional school assistant post is to be provided for every 40 additional enrolment of students instead of 35 additional enrolment as per the order indicated in the Government Order. 8) The school rationalization exercise shall be undertaken under the supervision of the Committee headed by the District Collector. 9) The District Educational Officers shall draw the plan of action meticulously in the matter and shall monitor the process closely. 11)The Upper Primary School with <30 (VI and VII) and <40 (VI, VII and VIII) enrolment where there are no other Upper Primary I High School within 3 Km radius, such schools may be continued. 13)During 2011 Rationalization exercise, due to shortage of Maths subject teachers posts, Physical Science teachers were posted for teaching Maths subject. Now, such posts should be treated as SA (Physical Science) in the current Rationalization exercise. 14)The following support will be provided from PMU/IT Cell of this office. i. PMU/IT Cell will share the UDISE data as on 31.12.2016 to all RJDs and DEOs. iii. A software tool will be provided for school consolidation in the logins of respective DEOs. This tool integrates the UDISE data of the school with the school coordinates and Panchayat GIS data provided by the DEOs earlier. This integration helps in drawing reports of schools which have potential for consolidation/ rationalization. Based on these reports, DEOs will get the field level verification done and identify schools that can or cannot be consolidated, based on the exceptions provided in the GOs. iv. A user manual will be provided for ready reference. v. After field level verification of positive consolidation of schools, the signed copy of list of school should be uploaded on the defined web. Further, all the Regional Joint Directors of School Education and the District Educational Officers in the State are requested to correspond with the following email l.D for any information I valid clarifications, if any, duly apprising of the same to the Joint Director (Services) of this office. The Regional Joint Directors of School Education and District Educational Officers shall follow the instructions I guidelines scrupulously. Any deviation of the given instructions I guidelines, they will be personally held responsible in the matter. 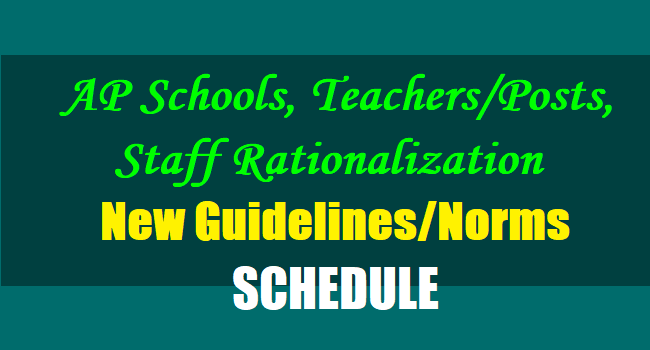 AP Schools Rationalization Schedule, Guidelines-AP Rc.